Festuca pratensis, the meadow fescue, ( syn. 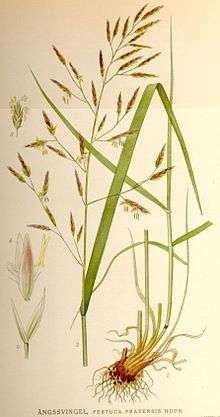 Bromus pratensis (Huds.) Spreng., Bucetum pratense (Huds.) Parn., Festuca fluitans L. var. pratensis (Huds.) Huds., Festuca elatior L. subsp. pratensis (Huds.) Hack., Lolium pratense (Huds.) Darbysh., Tragus pratensis (Huds.) Panz. ex B.D.Jacks., and Schedonorus pratensis (Huds.) P.Beauv.) is a perennial species of grass, which is often used as an ornamental grass in gardens, and is also an important forage crop. It grows in meadows, roadsides, old pastures, and riversides on moist, rich soils, especially on loamy and heavy soils. It is a tall, tufted grass similar to tall fescue Festuca arundinacea. Tall fescue differs by having minute hairs on the auricles. It can hybridise with Lolium perenne and Lolium multiflorum. It is a perennial bunchgrass, (i.e. grows in tufts), which grows 30–120 cm (12–47 in), flowering from June until August. The panicles are green to purplish. The spikelets have 5 to 14 flowers. It has a short, blunt ligule compared to other grasses 1 mm high. The leaves are bright green and up to 4 mm across.